After the whale of a time we had with Greece in April, we’re saying ‘hello’ to one of its neighbours – the eclectic island of Cyprus! Cyprus is one of our favourite holiday destinations and a traveller’s paradise, bringing together the best bits of Greece and Turkey in one holiday haven. 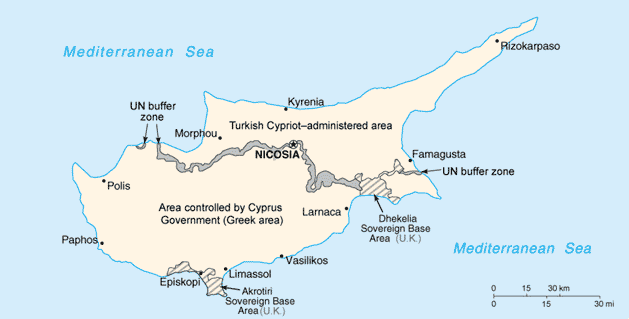 Aside from being the third largest island in the Mediterranean, trailing slightly behind Sicily and Sardinia, Cyprus is notable for being an island with a split personality: almost two-thirds is known as The Republic of Cyprus, while the remaining area to the north is the self-proclaimed Turkish Republic of Northern Cyprus. This gives it a rather unique atmosphere with two very divergent, individual cultures present on the island married by one that is distinctly Cypriot. This diversity is reflected in the variety of Cypriot holiday destinations – Ayia Napa is renowned for its 24 hour parties, while Paphos to the west is a haven for couples looking for romance in the birthplace of the Greek goddess of love Aphrodite and Coral Bay caters to those looking for a quiet, family-friendly resort. Cyprus’s west coast is where you will find the more traditional side of the island, replete with olive groves and picturesque white houses perched on steep ridges halfway up mountains. For a true taste of Cyprus, you need look no further than the remote community of Lefkara in the Larnaca district. This sleepy little village is known as ‘Lefkara the beautiful’ and ‘The Lace Village’ to locals, owing to its natural beauty and a long-standing tradition of fine lacemaking amongst the villagers. You can’t visit Cyprus without strolling down Lefkara’s narrow, cobbled stone streets while biting down on delectable locally-produced Turkish delight. There is so much more to discover on a holiday to this diverse island than we have mentioned here – so without further ado prepare to delve deeper into wonderful, beautiful, magical Cyprus with Holiday Hypermarket. Read previous What’s the Tastiest Country in Europe?